All JSON-LD related details should go into a separate section (e.g. Appendix: Considerations for JSON-LD similar to the section in Annotations WG spec, but open to Editor alternatives) and also allowed in the Extensions section. Both typical publishers and developers should not have to worry about JSONLD. Keep AS2 work going on the Recommendation track. Close ISSUE-46 as redundant according to jasnell. Yes, there might be paging at multiple levels of the protocol. <aaronpk> Audio should be better once I get there with my mic. <tantek> remote folks, if you could say if you can hear people as they introduce that would be good! <rene> obviously it's a problem in SF with the sound. <kevinmarks> are you nodding ben? Arnaud: morning today is on activity streams. any suggested changes? in general, it's nice to have remote video on, though, once kevinmarks is off the train. sandro: can we be clear about where issues are being tracked? Arnaud: RIght, do we have all the issues recorded at this point? Would closing all issues mean we're ready to go to CR? Or are there people still waiting in the wings? ... If there's a fundamental issue, F2F is the best time to bring that up. tantek: jasnell what workflow would you like with issues? sandro: clarifying --- "I'm not sure what this sentence means" -- should be open an issue? tantek: right, let's record that. bengo: In the charter, it mentions a social syntax deliverable. Is there a reason this is the only one? What about Turtle or something? tantek: There's nothing that makes AS2 the only spec. It's just the most mature and active of the inputs. eprodrom: One of the architectural concerns, brought up by people not here, that's it's not PURELY JSON-LD. There's an expectation that it will be useful if parsed by a regular JSON parser. ... I think that's something regulars from AS1 are used to, but it's a culture clash. <tantek> aaronpk you can walk in 7 minutes from Embarcadero station to MozSF! Arnaud: Is there a specific issue on this? tantek: We resolved this ages ago. That all JSON-LD support was to be optional. cwebber2: AS is a JSON document, with an implied json-ld vocab, so if you run it through a json-ld processor with the right context, you'll get out triples. ... with a couple of potential exceptions, it's json data with an implied context. jasnell: The only exception is when dealing with extension. ... so to do extensions, you need json-ld. <aaronpk> can we collect all the resolutions on a single wiki page or something? Arnaud: trying to pull the rug your way is non-productive. <Zakim> tantek, you wanted to raise general re-reading feedback on AS2 and to also follow-up to eprodrom and to object to "JSONLD is designed for that"
tantek: I agree the marketing pitch is JSON-LD is designed for that. But in practice we've seen in the group, "because it's json-ld, we must do this...." THere have been so many threads in that direction, it's really unproductive. ... I'd say it's a failure on the part of the chairs not to stop those discussion. We should be drawing that hard line. ... I've been seeing folks saying "because I'm using a JSON-LD processor, you must do X"
... I'd like us to reject those. <kevinmarks> is this the issue of JSON-LD rejecting some kinds of JSON, eg lists of lists, which means geojson is incompatible? cwebber2: Yes, it only gets complex in extensions, but still you can think in dumb json. ... it's only if you want to be able to consume from everybody, that's when you need json-ld. ... so it's only if you want to be able to robustly handle every extension. <tantek> interesting, so even for extensions, if you have special knowledge of particular extensions, you don't need JSONLD? cwebber2: a lot of people are saying they don't want to do that, and that's fine, they don't have to do that. <kevinmarks> but if I nest lists the JSON-LD processor will fail? cwebber2: it's not that much of a challenge. Arnaud: Back to my point, any other issues not recorded? tantek: I proposal all mentions of json-ld in AS2-core go into a section, "Considerations for JSON-LD". <tantek> PROPOSAL: All JSON-LD related details should go into an Appendix: Considerations for JSON-LD (similar to the section in Annotations WG spec), both typical publishers and developers should not have to worry about them. cwebber2: I'd be fine with that, but maybe an easier approach, with less major re-architecting, is to add it to a pre-amble, -- this whole spec can be deal with like that. tantek: I think the work is worth it. ... expecting the editor to say "Great, send me pull requests"
Arnaud: How much work would that be? jasnell: There are several mentions where I could s/json-ld/json/ without harm. jasnell: I don't think it would take much. ... not an appendix, but in extensions, and in a section at the top. tantek: Specifically, the proposal was about 1.2, serialization notes. sandro: I like the idea of hiding everything but plain-old-json from people, putting them into a particular couple sections. jasnell: I'd like to leave the tabs in, they;re useful, and we agreed in the past. eprodrom: Not sure there's much value to talking it through more. cwebber2: This seems like a useful thing, but I'm concerned about whether this is a CR blocker. It's an editorial change. This meeting, my goal is to see how many CR-blockers we can knock off the queue. Let's kick those boulders off the path! Arnaud: it's not a blocker, although it's a big change. ... If it doesn't change compliance, we can do it later. azaroth: If there are four syntaxes in the document, testing them will be really hard. So that's a blocker for CR. Arnaud: All these other tabs are informative. <tantek> PROPOSAL: All JSON-LD related details should go into an Appendix: Considerations for JSON-LD (similar to the section in Annotations WG spec) and also allowed in the Extensions section. Both typical publishers and developers should not have to worry about JSONLD. tantek: two things. My proposal was to move json-ld to an appendic, which I think IS cr-blocking. cwebber2: I think this is a great proposal, but I don't see how it will change implementations. So how is a CR blocker. tantek: If people see it as a JSON spec, they can jump right in. If they think it's JSON-LD, they'll think they need all that tooling. ... I think we'll get more implementations faster if we move JSON-LD to an appendix. ... I have specific issues I could raise on this. jasnell: counter-proposal -- I don't think adding an appendix would help too much. Give me an opportunity to come up with a counter proposal. <tantek> UPDATED PROPOSAL: All JSON-LD related details should go into a separate section (e.g. Appendix: Considerations for JSON-LD similar to the section in Annotations WG spec, but open to Editor alternatives) and also allowed in the Extensions section. Both typical publishers and developers should not have to worry about JSONLD. RESOLUTION: All JSON-LD related details should go into a separate section (e.g. Appendix: Considerations for JSON-LD similar to the section in Annotations WG spec, but open to Editor alternatives) and also allowed in the Extensions section. Both typical publishers and developers should not have to worry about JSONLD. <tantek> kevinmarks: Hi I'm Kevin Marks and you saw me on the train. <aaronpk> Good to see everyone! sandro: does it make sense to try to make a deadline for new issues from the WG? ... right now it feels like we're still in the post-chair-threat, with lots of new issues coming in. ... one question I have, we seem to have a rough process of submitting github issue when we see something wrong, we leave it up to editors to make decisions, if not palatable then take it to group. Deeper issues go to group. Arnaud: github allows for more a agile approach, but there are some issues. ... what big changes have their been? It seems very stable. tantek: I suggest waiting a week before setting a deadline. ... to see if we get a boost. tantek: if the thought of spec going to CR or NOTE scares you, you need to speak up right away. tantek: we're unlikely to go CR today, but we're also unlikely to drop it down to a NOTE. <cwebber2> could we make that into a real proposal? sandro: Can core move ahead of vocab? cwebber2: cage rattling worked, but lets not have cage rattling for its own sake. <eprodrom> PROPOSED: Social WG will continue working on Activity Streams 2.0 in order to get it to Candidate Recommendation. <cwebber2> should I write up a proposal for the deadline next week? <tantek> PROPOSAL: Keep AS2 work going on the Recommendation track. azaroth: We'd like to be able to refer to AS2 collections from Annoations soon, so please keep it moving along! RESOLUTION: Keep AS2 work going on the Recommendation track. <tantek> who is remote? ben_thatmustbeme ? jasnell: Will we have time to talk about testing this morning? tantek: do you only want to look at old issues, or look at new ones from today? <sandro> PROPOSED: Close ISSUE-46 as redundant according to jasnell. Yes, there might be paging at multiple levels of the protocol. RESOLUTION: Close ISSUE-46 as redundant according to jasnell. Yes, there might be paging at multiple levels of the protocol. Arnaud: what do we need to do to close this issue? <azaroth> Link to the ED please? Arnaud: has no impact on the spec? <tantek> PROPOSAL http://www.w3.org/wiki/Post-type-discovery addresses Issue-4. <sandro> and so ISSUE-4 can be closed, safe in the belief that post-type-discovery will proceed as warranted. <kevinmarks> are you going to +present your babies ben? Arnaud: the answer is always no. sandro: How do you deal with... if you ever add a term to AS2 and somebody has made an extension that uses that same term..
jasnell: Is there any expectation that once this WG is done and we've published this, that they would want to do another version later? jasnell: Can these new terms be introduced by extensions? sandro: Where would they be? Wouldn't be standard? <tantek> we are breaking AS1 right? <tantek> jasnell, but they have different mime types right? <tantek> jasnell, that's better than I thought then. <kevinmarks> AS1 can only be processed as AS2 if you mung it to JSON-LD and back, right? <tantek> AS2 processors can consume AS1 then? <tantek> what is the informal mime type for AS1? <tantek> can JSON-only AS2 processors consume AS1? or do they require @context processing to alias things? <kevinmarks> bengo, could your as1 context be used to make a JSON compliant as2 version of an as1 stream? Arnaud: Can vote on proposal? eprodrom: this sounds like we're leaving the issue to be decided on later? <sandro> -0 I don't think this is well enough understood, but whatever. <sandro> this sentence is misleading: Following are three examples of activities with varying degrees of detail. Each of the examples uses an implied JSON-LD @context equal to that provided here. ... If extensions become popular..
... How do we ensure that that lifecycle proceeds smoothly? <bengo> tantek is there a github issue for this? ... Does anyone have an objections? <tantek> +1 to "name" instead of "displayName"
bengo: I know there's part of the spec that compares with as1..
bengo: does that also reserver displayName? jasnell: Yes, it should. I'll make that change. tantek: quick question, I filed issue regarding lifecycle/naming. Quick thumbs up / thumbs down for naming convention, of issue. Right method of filing? ... that content would still hold the main content? kevinmarks: Examples are images and things. Would it be src rather than href? ... The other thing is, we now have the ability to link to multiple variations o fthings. How do we represent that? kevinmarks: But doesn't necessarily catch all things in source? azaroth: Doesn't seem clear to me. Can we clarifiy? jasnell: Can you open an issue to clarify that? <aaronpk> azaroth, are you drafting that issue right now? jasnell: What I would ask, about the basic idea, is take a stab at a concrete example of what it would look like in this syntax: I have an image object, I want it available at multiple resoultions. What would that look like in the json? A strawman would make it a lot easier to work out what to do. ... Are we setting up something like this for our url property? eprodrom: Mostly it's just a string, but there are legitmate use cases. JSON objects could blow up consumers that are looking for strings. <tantek> +0 I don't understand it enough to disagree. trust rest of wg consensus. eprodrom: Could we instead reserve half an hour to discuss testing? <bengo> Test suite of just Social SYntax? or are we talking all? Arnaud: does ben have to drop off? ... not sure if it's my turn to speak on issues, or still talking about agenda? rene: the question is that james often argues that things could be easily implemented as extensions. My question is whether this arguement is a group one, or when it can be applied? ... Don't mean to imply otherwise. Do we have an open issue on this? <cwebber2> rene: we could also discuss next week if worst comes to worst right? eprodrom: one question for those who have been through this process before, is whether testing at that level is what we're looking for in implementation tests? kevinmarks: what is it translating from and to? ... the question is, do you understand this json? <Zakim> azaroth, you wanted to suggest json-schema ? ... but we actually want to see whether some sort of action is correct right? azaroth: but the actions taken by user agents in response to the format is not normatively testable? <tsyesika> err, is talky still running at your end? <eprodrom> tantek: is talky broken? sandro: You have a framework. Do you have a list of tests? ... Does that answer the question? ... There's no definition of 'implementation' - is it a lbirary, is it a parser? ... But they were useless. Haven't implemented something real. ... Every possible thing in the feed is a thing can see and understand. Everything you can produce is a thing that a human can do. Arnaud: what does html do? <jasnell> for instance, it does not say, "this like activity should be displayed like this, implementations must pay attention to these properties, and present the information in a particular way"
<azaroth> cwebber: You could read off of disk, rather than pull from online? sandro: what are they going to be generating? cwebber2: evan built something, is that a good direction? If not, is somebody willing to help something better? cwebber2: is pump.io already fulfilling this if it uses as2? Arnaud: could we develop one document where every feature of the spec is at least used once. Bare minimum for test suite. <cwebber2> so in a certain extent, building the api / federation tools helps us achieve that? jasnell: We have to have a document that describes expected behaviour when you receive one of these activity statements. That's separate from saying is that statement valid or not. We need a document to describe those things to be able to test them. Arnaud: Clear we're not going to finish this today. Will continue on next call. <tantek> cwebber2, agreed - which is why I asked sandro to capture his proposal - e.g in a github issue - so you can comment on it like that! Arnaud: when you say more useful, than what? Arnaud: What do you want from us? ben_thatmustbeme: I don't know. I created the serializaiton. Aaron, you originally added it to an agenda that got dropped for 3 or 4 weeks? eprodrom: my question is - are we looking to replace as2 as social syntax? publish it parallel? examine it abstractly? have it be compatible? <Zakim> azaroth, you wanted to confirm that as only JSON is normative per -core, that this doesn't block progress? azaroth: JSON as the only normative serialization of AS2, this doesn't block anything. This is a separate process? azaroth: Potential straw person, we're blitzing through CR and got the AS2 doc to TR, and work was done in jf2, we would not want to go back and change anything about AS2 core or vocab? Arnaud: is this a subset of as2 or not? scribe: in as2 already, verbs are nouns. We're already on that track. eprodrom: I really liked tantek's analysis of the two different kinds of streams. You can't actually have a Collection of Objects currently. Arnaud: find out where there is misalignment between two approaches. I don't see any reason to change the way we are dealing with this. Note definitely a possiblity down the line. We don't need to agree on this. THe conversions can keep on going. <tantek> ben_thatmustbeme, what do you mean by "a document within the group"? <kevinmarks> isn't it still being edited the definition of an editors draft? <aaronpk> if "editor's draft" has implications other than "we're working on it" then isn't that an issue with the term "editor's draft"? <tantek> PROPOSED: Accept jf2 as an editor's draft with no commitment to rec track or even note track, but rather as a means to improving AS2. <tantek> ben_thatmustbeme: are you coming back for remote participation? <tantek> we may re-use the projection screen for demos etc. <tantek> anyone else from the doc? <kevinmarks> tsyesika: do you want to reconnect to talky? <aaronpk> we can keep people on talky and just not project them too. they'll just be a tiny face over at this end of the table. tantek: next thing I saw activity pump had aaron? I'm going to change that to chris. <trackbot> Sorry, Arnaud, I don't understand 'trackbot, draft minutes'. Please refer to <http://www.w3.org/2005/06/tracker/irc> for help. eprodrom: any other agenda modification? <tantek> who is on the talky? eprodrom: we have about 4 hours in order to get through social api and annotation. eprodrom: we could do an hour a piece. is there anything that may take longer? eprodrom: if we reach the end of our agenda, should we try to address as2 issues or any better ways to spend our time? ... the top you'll see three links to other specs. it will have a small summary of each. ... it is most interesting to me to hold off on separating the specs for now. I have a hard time reading through all of them. <Zakim> tantek, you wanted to ask what do you need to publish this as a FPWD? cwebber2: (to amy) it is just activitypump that has the conversion? <sandro> or "Social Data Distribution Protocols"
rhiaro: no. I have all of them. they are linked yet. tantek: I like the document and Amy's approach to converge the various concepts. <tantek> if we're renaming, possibly "Social API Comparisons" ? <kevinmarks> wseltzer: do you want the av feed? <tantek> rhiaro, consider linking to https://www.w3.org/wiki/Socialwg/Social_API/User_stories perhaps in a requirements section ? cwebber2: so, it maps the space and highlights convergence. so hopefully the various spec groups help you with that feedback toward that goal. sandro: are we going to mix and match or pick one and refine? rhiaro: it is useful to note the indieweb set of specs which are already broken down. and they use pubsubhubbub, but we can't link to it?? eprodrom: there were patent issues with google about PuSH. another issue is that it doesn't private distribution. aaronpk: but nothing does. so we could extend it to do that. 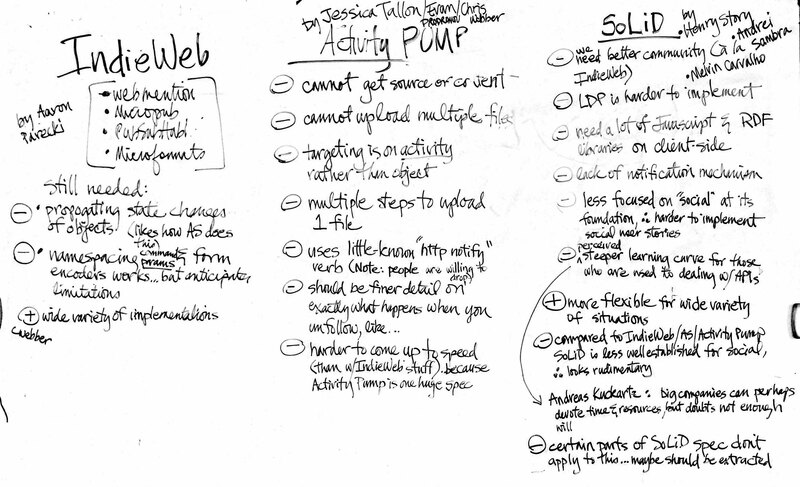 sandro: when I read the activitypump spec yesterday I thought 'this is such a nice coherent whole' and the indieweb spec is also nice and coherent. <Zakim> tantek, you wanted to discuss PuSH "status"
eprodrom: sounds great. I'm making that action. ... it is a good option for us to follow. there are some good things about PuSH that makes sense to pursue. ... it may also be reasonable of us to consider other options, like implementing just the web hook part of PuSH. ACTION eprodrom contact Julian as a chair and ask about the status of PuSH and cc wendy and see if we can get to a point where we can at least reference it or possibly incorporate into this WG. <trackbot> Created ACTION-80 - Contact julian as a chair and ask about the status of push and cc wendy and see if we can get to a point where we can at least reference it or possibly incorporate into this wg. [on Evan Prodromou - due 2015-12-08]. aaronpk: I want to follow up sandro's comment about flipping a coin. <kevinmarks> activitypump seems to combine reading and mentioning? aaronpk: my point is that we shouldn't start with either spec and work from there; look at functionality. <kevinmarks> is the inbox endpoint in activitypump the same for mentions and posts your subscribed to? ... the next step would be to weigh up pros and cons, is that what you mean? rhiaro: yeah, that's what I need help and feedback for. cwebber2: [to aaronpk] is this something you would be interested in? aaronpk: you mean the structure amy proposed? cwebber2: yes. and there may be disagreements but we can have the goal of unifying them. <Zakim> azaroth, you wanted to suggest a feature matrix as input to way forwards? azaroth: as far as gh issues, are those ok? <tantek> eprodrom, maybe as issues rather than in the spec? <tantek> eprodrom, I think perhaps azaroth's proposal of a feature matrix overview would help with that? <bengo> What is the canonical 'restructured' doc? cwebber2: we could have just one specification. it is one thing to say "Amy, great specification" and another to say this is something I will definitely do. cwebber2: you want tabs? like JSON-LD, etc? tantek: ok. the question is whether or not there are any FPWD blockers? eprodrom: since this is a process document about determining among a few API recommendations, is it an internal document? or what do we expect to publish it? sandro: yeah, and what I would want is to make issues out of any divergence and fix them. tantek would still publish as is? eprodrom: I want to check to see if we have made progress on the convergence of the social api. is it a single spec? is it two or more specs? ... is one or more of them a candidate recommendation? or too early to decide? sandro: I guess the question is when do we decide? do we want to have a recommendation by the end of the WG (around a year from now)? tantek: yes. and this implicit method is working. ... the waterfall pick-first approach has failed. let's admit that and move on. <bengo> revisit (very real) charter timeline constraints in January? eprodrom: I'm good with that. I just want us to be able to visualize an end-point that's good for us. sandro: that's if we don't get to Rec or even notes? eprodrom: even notes. I'd be happy with publishing a few notes and some explanation why we didn't get to Rec. I would love a Rec. ... if we learn a lot and we all become better people, that's great too, but maybe not worth the time and effort. ... given that is our lowest thing and that's so clear, we aren't wasting our time? eprodrom: that seems like reasonable goals. ... 1. we produce one spec that does all the things. <bengo> aaronpk I agree and think that's the next step. e.g. "This is how webmention fits into Responses use case 1"
<azaroth> And tag with FPWD in the issue title? <bengo> Will the document stay as 'socialapi' repo or also have name changed? <bengo> FPWD of "Social Protocols Comparison"
eprodrom: sounds good. wanna make it a proposal? eprodrom: so maybe we take our 10 min break at 4pm? <rhiaro> If someoen wants to bikeshed about naming (in the nicest way possible) can yo uopen an issue and keep to one thread? <tantek> didn't we have a resolution for kevinmarks to be the liason? shepazu: I don't recall that resolution that there would be a specific liaison. I thought it was just to be resolved by the chairs. shepazu: ah. it was not clear that he would be liaison. <tantek> minutes from the joint Social Web / Annotation WG meeting TPAC 2014? tantek: ok. let's assume a mistake and move on. ... do we still need a specific liaison? kevinmarks, you were nominated, are you ok with it now? azaroth: yeah. having a path forward to look at how annotations would look with webmentions etc would be good. eprodrom: our queue is empty. do we have any more to discuss? shepazu: sorry, was this just discussion about a person who would be liaison or about the technology? tantek: more admin process than tech. kevinmarks: yeah, it was just to clarify because this wasn't together. if you want to discuss tech, do it. tantek: is there a issue to pull collections out of core to a new spec? tantek: to be clear, I'm not proposing this. just that people should bring that up. eprodrom: do we have more to discuss about liaison to annotations? eprodrom: good. Any other agenda items? ... most fleshed out part is creating objects, other operations happy to keep getting feedback on, and changing. ... What else would people like to see? cwebber2: Main thought was, have you thought about server to server? <tantek> both Quill and Woodwind do server to server Micropub right? ... which is acting as a client ... so now where's the server? <tantek> I've got a pretty good idea why webmention and micropub are distinct and separate (differen trust pre-requisites and user models). aaronpk: Is the combination of micro + webmention missing something? cwebber2: You can convey the same type of terms, like RSVP ... all the same things can be done? ... the same set of functionality can be done, or is about linking document based web? ... what extent is the work being synchronized, and what extent is that work influencing micropub, or already aligned? <tantek> I don't understand the PTD question? Tantek: different kind of answer. What drove the different protocols. WebMention happened first. <Zakim> tantek, you wanted to note why webmention (federation) and micropub (API) are distinct and separate (different trust pre-requisites, user models, canonical data). Tantek: different user model between federation and users. ... it's a hard requirement, so very different from auth and user agency perspective, permissions, trust, number of actors etc. ... Maybe wrong with drawing the difference, but lots of differences? ... if I run my own pump io server, I know that I'm posting to my thing. The same design and serialization. ... what happens if you do mpub post to a third party? Do you have to "own" the micropub endpoint? sandro: You might auth once every long period of time? ... if it was PuSH service, ala activity pump, it would make sense? bengo: Maybe controversial, but keeping the object representation separate from what to do with the object. Curious why edit this or post this or delete this is in the body, rather than the method? aaronpk: Reason is to allow delegation of functionality, rpc-style. ... managing some of the life cycle of the social graph works that way. eprodrom: wrap up with micropub? anthing to discuss in next 10 minutes? cwebber2: ready to go to ED? ... I think we should propose it? <aaronpk> jasnell, what was your specific wording? eprodrom: everyone in late afternoon doldrums. Dinner at 7.
sandro: can you paste the link to that? ... would you maintain one single feed/collection of everything you publish? would you keep different collections by type? ... one collection of videos, of images, of text, or does it not matter? sandro: doesn't delete have the same thing? sandro: what about the other crud operations? <tantek> bengo - could you restate your concern? <bengo> List the things I triggered to create their side effect? sandro: let me rephrase. it often seems like the entire industry is in love with restful apis. i don't know why personally. <Zakim> tantek, you wanted to ask if the intent is to keep ActivityPump use of terms like "displayName" in sync with AS2 changes e.g. displayName->name ? tantek: is your intent in AP to keep terminology in sync with activitystreams? so do the displayName -> name change? <Zakim> bengo, you wanted to request answer to my orig question "What happens if I POST /outbox update facebook.com"? bengo: i still think it's unclear, if we're triggering crud operations, what happens if i put an update activity where the object is facebook.com in my outbox? what should I expect? cwebber2: so you're saying we should document responses when you do something screwy? bengo: does outbox mean always do this thing if you can? sandro: your feed can say "you became president, you deleted facebook, etc"
eprodrom: i think that makes the most sense, if this is a thing you're going to execute then try to execute and give back an answer. if it's something you don't understand because you can't do it, then assume the user is talking about something that happened somewhere else. bengo: now that i'm talking about it out loud that may not even be necessary. ... in the paris meeting i threw in something stupid. eprodrom: that's a good question. one thing we could do is define ... how many endpoints do we have for a user? 4-5? <rhiaro> rel=inbox ~ rel=webmention, rel=outbox ~ rel=micropub ... maybe?? <bengo> profile == link rel me? <tantek> rhiaro, I'd suggest clustering them with a prefix, like ap-outbox ap-inbox etc. ... what do peopel feel about that? tantek: it sounds like you have an issue defined. cwebber2: maybe ap-profile or something? bengo: in the times where it says go to a uri and it returns a json document. but if you send it an accept header with HTML only then it shouldn't be required to return JSON. leave room in the spec for content negotiation. ... this group has said it's not in scope, but by necessity is part of the specs. so far micropub and activitypump put OAuth 2 in the spec. <azaroth> Section X: Security Concerns. You should do authentication. sandro: should we spell that all out? bengo: oauth is a framework. it has things like client credentials for client authentication. i'm implementing openid connect, and yeah it's complicated. cwebber2: so then what do we do? ... how do we get interoperability? cwebber2: so is this so complicated that it doesn't belong in these specs? ... what is the group's policy on this then? eprodrom: at the risk of asking for crazy proliferation of specs, could it be a separate specification? cwebber2: i don't know what to write, anyone want to help? tantek: i did just pull up our charter to double check, the word identity is not in our charter. the reference to "auth" is one of the inputs from the indieweb community is IndieAuth. jasnell: the activitystreams spec has the notion of actor which has an ID, it has the "person" object type, and it says that if you are going to describe specific properties of a person then you should use vcard. cwebber2: what i was going to bring up was transient and private activities? sandro: would it be okay to leave it out of the first version? This page was last modified on 3 December 2015, at 17:13.